Description of "Homi Jehangir Bhabha (eBook)"
Homi Jehangir Bhabha, was an Indian nuclear physicist, founding director, and professor of physics at the Tata Institute of Fundamental Research. Colloquially known as "father of Indian nuclear programme", Bhabha was the founding director of two well-known research institutions, namely the Tata Institute of Fundamental Research (TIFR) and the Trombay Atomic Energy Establishment (now named after him); both sites were the cornerstone of Indian development of nuclear weapons which Bhabha also supervised as its director. Mrs. Nalinin Pawar is a Junior College teacher for 10 years in Gramoday Junior college, Nashik. 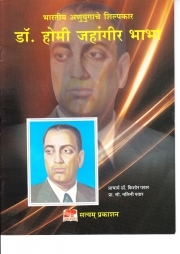 Reviews of "Homi Jehangir Bhabha (eBook)"